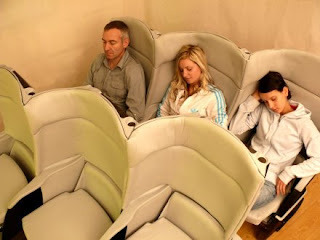 Finally, what we have all been hoping and preying for, an airline has actually come up with a great idea. Delta Airlines has designed a new seat configuration that staggers the seats in economy on an angle allowing each passenger to have their own personal space without rubbing elbows with your neighbor and also providing more legroom. We can only hope every airlines puts these on every flight, what a great idea ! Delta Air Lines' passengers may be doing double-takes when they step aboard their international flights in a few years. The Atlanta-based carrier is planning to install seats in economy class on international flights starting in 2010 that will look almost like office cubicles slanting across the cabin. Delta, which has been banking much of its future on how it does in overseas flights, says the seats will offer the double advantage of more comfort and more revenues. Delta hopes the staggered configuration will allow it to squeeze in one extra seat in each row. For instance, each row on its Boeing 767s will have eight seats instead of seven, said Delta spokesman Andy McDill. However, he said the new design and layout means each passenger also will have more private space. 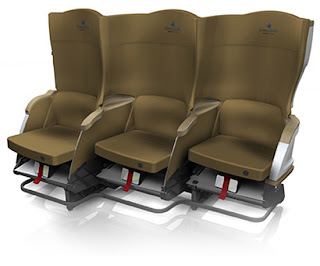 The wrap-around backs are stationary, while the seat bottoms move back and forth and down, giving the passenger more knee room even though Delta doesn't plan to change the distance between rows. "It certainly gives you a little more comfort, and a little more privacy," McDill said of the seats, manufactured by Thompson Solutions. The Irish company announced its deal with Delta earlier this month at a trade show in Germany. Delta hopes to get the Federal Aviation Administration's approval of the seat design this fall, and to begin installing the seats on its overseas-going Boeing 767s and 777s in 2010. Aww i would not prefer NWA to have this kind of set... my daughter loves to lay down on my lap and if they will have this kind of thing it won't be as comfortable for mommies with little babies hehehe.. But this is really good for adult passengers.